Where is research on MOOCs headed? The aim of this blog is to help me understand online learning. There is a new book “Preparing for the Digital University: a review of the history and current state of distance, blended and online learning.” G. Siemens, D. Gasevic and S. Dawson are working on a project of the MOOC Research Initiative (MRI) funded by the Gates Foundation. The goal of MRI was to mobilize researchers to engage into critical interrogation of MOOCs. The writers have gathered a big amount of research and built a frame for describing the situation until now. Siemens is a Canadian in Texas (MRI), Gasevic in Edinburgh and Dawson in Australia and the project seems to be global. The material they have used in the analysis comes mainly from North America, perhaps because of the language. They began from the autumn 2011, when Stanford University began its global MOOCs. The paper is an exploration of MOOCs; what they are, how they are reflected in literature, who is doing research, the types of research undertaken and why the hype of MOOCs has not yet been reflected in a meaningful way on campuses around the world. Much of the early research into MOOCs has been in the form of institutional reports by projects, which offered many useful insights but did not have the rigor, methodological or theoretical, expected for peer-reviewed publication in online learning and education. I was, as a learner, disappointed with this condition. Now the writers explored a range of articles and sources, and settled on using the MOOC Research Initiative as the dataset. I follow the part “Where is research on massive open online courses headed?” They report the ways which were used in collecting the materials. I am not very interested in assessing how well it includes everything – it never does- but I am interested in the content and the themes. motivation, attitude and success criteria. The submissions were dominated by the researchers from the field of education (75% of the accepted proposals). There is need to increased efforts towards enhancing interdisciplinarity. Keywords was the concept most often used when they describe their categories. Computers can find words, it is true. Quantitative and mixed methods were used more than qualitative methods. Both Gasevic and Dawson have developed methods for social network analysis and learning analytics. I list for myself some topics which may be worth following and further exploration. Engagement and learning success: the main topics in this cluster are related to learners’ participation, engagement, and behavioral patterns in MOOCs . Peer learning and peer assessment. Self-regulated and social learning and social identity were topics which analysed cognitive learning strategies and motivational factors and wanted to reveal students at risk. Social network analysis and networked learning: identifying central hubs in a course or improving possibilities for students to gain employment skills. Learners’ interactions profiles may be analysed in order to reveal different patterns of interaction between learners and instructors. Motivation attitude and success criteria: diverse motivational aspects and course completion. I have done my own observations about these themes while participating on many MOOCs. I have to check the material in order to find the most interesting results. I continue my journey to find meaningful results about open online learning. This research is new: Bonnie Stewart defended her thesis “Scholarship in Abundance: Influence, Engagement, and Attention in Scholarly Networks” yesterday in UPEI Canada and I followed it via YouTube. I’ll write this post not to assess her research but to ask myself questions. How do I understand the meaning of her work? What can I learn about it? what counts as academic influence within open networked circles? how does scholarly engagement in networks align with institutional scholarship? how do attention and visibility operate on Twitter, and how do they shape participants’ experiences of care and risk within networks? The participants were voluntary because they had to be ready for participatory work: invitations to expand, clarify, or reframe their answers. This is the only way to work in a research like this if you want to get deeper insight. I believe that the participants are a good sample of different scholarly Twitter users although it is not a statistically random one. More I am more concerned about the time period, because everything changes so quickly. The results are history already when they are written down. The first article dealt with influence and defined it as capacity to contribute (slide 8). The basic concepts are scale of visibility + common interests+ shared ties and these are connected to capacity to contribute to the ongoing conversation. Institutional affiliation doesn’t matter except for Oxford. (Here I disagree: I found David White to be a charming man and not only Oxford guy when I met him at an Elluminate session in 2009). Matter-ing matters is a funny way to illustrate the situation and I believe that I can follow the idea, and I agree with that. The second article is most difficult to follow for me because the concept scholarship has so many meanings. Networked practices = Scholarship. Scholarship of discovery/ integration/ application/ teaching (Boyer 1990 – nice to see an old source). And then Scholarship of abundance: a researcher wants to share his article so it could live its own life. Abundance is connected to openness here. The participants came from very different backgrounds, not only universities. (My first thought was that university workers have always been vulnerable, the work is connected to their intelligence and it is not easy). Bonnie describes her overall findings: networks operate in distinct pattern of connection, curation and collaboration. Generally said, so it must be so. Networked scholarly practices enable and demand scholar’s individual rather than institutional cultivation of influence, visibility, and audiences. Yes, they do. Digital networks offer participants a sense of being someone who can contribute, and contributions open new doors. The intersection of high networks status with lower or unclear institutional status creates identity dissonance. This must be true as well, I can imagine. What happens in the future then? One way is that networks become institutionalized and consequences of public speech become amplified etc. Twitter is used in tactical ways for helping one’s career building. I don’t know how separate from each other are traditional university habits and open social habits or is there much overlapping already. All that is said to be new is not new at all. 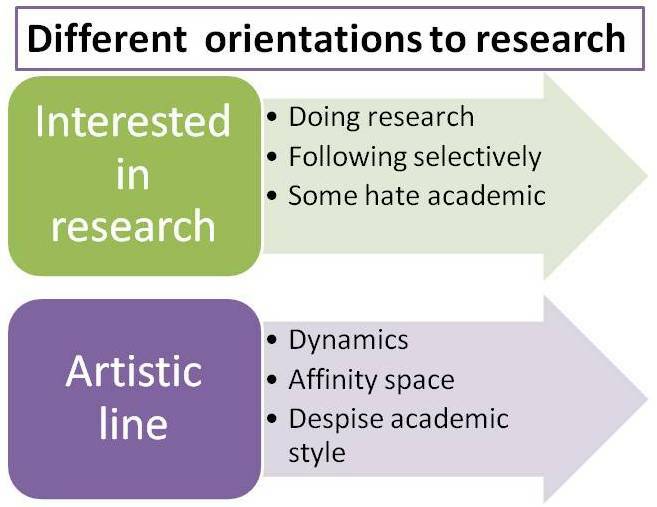 If you are interested in these themes please read Bon’s blog, in which he tells about the research process and results. I’ll continue with the theme which I began in the previous post. I will try to find answers to the question: what do I learn about the newest research article by Jenny Mackness and Frances Bell. I chose my line in the previous post: I copied the open survey questions and the reported results as positive (sunlight) or dark or negative (shadow) sides of participants’ experiences. I told that this is a normal situation in any massive courses, how else could it be? Many love, some hate and most people are between. I consider these results as some kind of side effects, very obvious and simple as such. I am more interested in the content of the answers. The first three begin with “How does the image of rhizome relate to” and continues “prior experience of teaching/ learning (1) or learning in Rhizo13 (2) or future pracice (3). The questions are relevant of course but for instance I could not answer them although I had participated actively and blogged many posts. I do not understand how that image could help me in my learning or teaching. I told this to the researchers and they tempted me to answer the 4th, totally open question about my experiences. So I did, because I always support research about MOOCs. I didn’t find my original answers from my computer but I am wondering if I can interpret my experiences as positive or negative. It is both as always. I learned what I wanted and my interest didn’t die even it didn’t focus on rhizomatic thinking. The researches mention on the page 31 that the principles of Deleuze and Quattari were not discussed but nevertheless influential in the way the course was designed and experienced. I suppose that other participants could answer better than me and I should like to know what is the meaning of this sentence: “For some the course promoted deep or wide learning, was transformational and had a positive impact on classroom practice” (p. 32). Perhaps explanations will come in the next article, I can wait. I am writing in order to find my own thoughts. Is there a hidden belief that Rhizo14 offered some quite new or revolutionary pedagogy in the history of pedagogy? What if a participant has lived in the middle of similar experiment for many decades? People have a tendency to love what they do and appreciate the courses in which they participate. It is a group process with known dynamics which makes people happy for some time, nothing wrong with it. But it not all learning. It would be a theme of a new research to follow for instance happenings in the FB Rhizo group. It is still alive but why and for which purposes? Ethical implications are still lacking here, even they are the focus of the article which I have handled. So I’ll have to write more some day. Thanks to Jenny, Frances and Mariana for getting me and Simon Ensor to comment! Jenny Mackness and Frances Bell have published findings from Rhizo14 in Open Praxis, vol 7, issue 1, Jan-March 2015, pp. 25-38. The title of the article is “Rhizo14: A Rhizomatic Learning cMOOC in Sunlight and in Shade”. I have written about their research earlier and I was very interested in reading this publication. What is new, are there any deeper interpretations about learning in cMOOCs? For many participants Rhizo14 was a very positive experience. They valued the metaphor of the rhizome for teaching and learning. It gave a new way of framing education, exploring education and thinking about education. (A long list of adjectives which I can’t follow 🙂 ). These participants valued the lack of a centre = the lack of traditional tutoring and the lack of prescribed content. They valued the high emphasis of learner autonomy, self-organization and handing over control to learners. The course was experienced as a spirit of exploration, openness and experimentation. These were thought to be important aspects of Rhizo14. The Facebook group was active also after the official course time and this was the light side of Rhizo14 (page 32). The majority of survey results were positive. There was also a dark side for those participants who did not feel connected and could not find a voice in the community. They felt isolated, They felt unable to make meaningful connections despite in some cases being experienced MOOCers. One viewed the emphasis on community as an unnecessary pressure, which led to artificial effects, exclusion and limited learning. Another viewed the community as disjointed networks of pre-established subgroups. Another described the community as having a dark edge. These participants felt that there was a lack of appropriate facilitation, and there were inappropriate exhibitions of power and politics in the course. Some felt that the course was based on weak philosophical foundations and that the rhizome was an empty signifier, Some questioned the lack of content and felt that the course lacked depth and theoretical discussion (and many adjectives again which I can’t follow). This was a short summary of what I consider as essential results in the article. I agree with the researchers that it was valuable to get some descriptions about the dark side of MOOC learning. Usually those participants leave the courses without telling more about their experiences. The positive side of learning communities is so well known that I suppose educational researchers are tired of reading praises of the pedagogy which the researcher supports him/herself. They are mostly pseudo-science more like religious confessions. My orientation differs in some parts of the article. I do not think that Rhizo14 is an exceptional pedagogy or a new experiment. I think that the internet is the experiment in which we all are taking part. The background of the research could consist of the developers of the free internet and describe the Rhizo14 as part of this continuum. Dave Cormier began with Jeff Lebow in the year 2005 or so and they have proved that interaction can really work. The roots of pedagogy in the free internet are very old and well-known in the history of educational sciences and practices as well as politics demanding democracy. I am not sure what is the value of connectivism. It is a list of good principles or aims – and those can be easily forgotten in praxis. I don’t believe that the differences between c and x MOOCs are true. There is political discussion between the free individuals versus all institutions. The world of education is not so simple. It is my lifelong interest to follow research about learning events during cMOOCs. This time I’ll tell about an article Participants’ Perceptions of Learning and Networking in Connectivist MOOCs, written by Mohsen Saadatmand and Kristiina Kumpulainen. It was published in Merlot Journal of Open Learning and Teaching in March 2014 and you can read the whole text here. I remember this research because I have answered all the questions and had discussions with Mohsen during the PLENK2010 and CCK11 courses. I liked the way Mohsen planned the research. Now I can learn more using his article. I have to copy pieces of the article in order to use the right concepts, please read the whole article if you are interested. This is only a short copy of it. 1) How do participants in cMOOCs use tools and resources for their learning? 2) What networking activities take place in cMOOCs? 3) What is the nature of participation and learning in MOOCs, and how is it perceived by Mooc learners? I am interested in the question 2 and 3, not so much in changing tools and resources. Twitter had become well-known in those days, perhaps for the first time in cMOOCs. I liked some concepts Mohsen used to describe the research: the study employed an online ethnography design to gain deeper understanding of participation and learning in cMOOCs. Online ethnography or virtual ethnography is a method designed to study cultures and communities online, and the complexities of technologically mediated social worlds. Because of the researcher’s crucial role in ethnography, Mohsen participated in and observed different MOOCs since autumn 2010, which enabled a better understanding of the nature of learning in the MOOCs. I remember him. The methods consisted of an online questionnaire, online semi-structured interviews and autoethnographic insight. The numbers of complete answers were low but it is not necessary to get all the answers to understand a phenomenon. The data were interpreted using an ethnographic research design based on a framework of analytic induction and comparative analysis. In this framework, the broad and existing categories and the initial definition of the phenomenon of study were examined through preliminary observations and a small case data collection process (questionnaire). They then underwent continuous refinement throughout further data collection and analysis. The process continued by redefining the phenomenon, developing and reformulating research questions over the course of research, and modifying and refining them based on subsequent cases and more data collection phases (e.g., interviews, participants’ artifacts). Different sources of data were scanned for categories of the phenomenon and relationships among them. Ethical issues pertaining to online data retrieval were addressed well and the list of references was long and includes all needed sources. I trust it, no need to check them. Some results: A great majority (87.5%) believed the cMOOC environment helped enhance student autonomy and improve self-directed learning by defining their learning goals and organizing learning activities and interactions. This is perhaps due to the less structured nature of cMOOCs, which creates more room for learners to shape their learning. The role of the instructor is also as important in MOOCs as in a traditional learning setting. MOOC learners had a positive attitude toward the support and feedback received from the course instructor or other course facilitators. The results show that participation in MOOCs challenges learners to develop self-organization, self-motivation, and a reasonable amount of technological proficiency to manage the abundance of resources and the more open format. Participants in cMOOCs use an array of technologies and various networking skills. The nature of cMOOCs requires students to assume active roles, in a spirit of openness, to shape activities and collaborate in goal achievement. In the dynamic learning environment of cMOOCs, learners become more autonomous in selecting tools and resources, making sense of information and finding their appropriate learning pathways. Although the descriptive results of this study were based on rather a small number of responses, the data triangulation of online interviews, participants’ online content and interactions, and autoethnographic insight provided a rich account of the nature of learning and participation in cMOOCs. The findings of this study can be further explored in different MOOC contexts. My copy ends. These results are well-known, but how to go deeper into participatory learning ? The voluntary answers as in this research tell about the most active students who ‘know the rules of the game’ and want to learn more. I don’t know how to continue but I’ll seek for other interesting studies. How to measure the success of learning in rhizo14? “Share your personal story of rhizo14 in your own voice. You could freewrite, link to some of your blog posts, quote things you said in Twitter/Facebook or if you prefer a loose structure you might like to consider some of the questions below.” The last question was: “measures and perceptions of success? ?” and it was connected to an article of Bentley et al 2014 “measures of success and perceptions of the success of their learning (OLDSMOOC, many cases) . I’ll only deal with the answers given to this last question for rhizo14 participants. Half of the 31 participants had answered this question (15). I’ll summarise their results and leave away the other half: more individualistic solutions (images, zeega, numerous links) or very short answers without a clear comment on learning. Perhaps it is worth mentioning that eleven answers to the given question were given by men and only four of women, while the total distribution was 15/16. How to interpret this difference? Does it matter? Each individual participant has to define their own goals and measure the success in relation to them. Although we had the option of presenting a personal project .. we didn’t use it. Dave Cormier has given his guide how to participate successfully in a mooc: only one used his concepts (declare or focus). Success = meaningful connections for own learning /new friends/names to recognise. As my intent was to work at building a personal learning community, I’d say the success of that is ongoing. I am successful when I strengthen the useful connections I already have, make some new useful connections, and identify some potential connections that might be useful. Making connections with individuals who have a passion for connection (and education) is priceless. That, much more than content, was the largest part of what I define as success. From my own teaching and research experiences, the building of learning communities is the key. James Paul Gee talks about affinity spaces and Etienne Wenger-Trayner writes about communities of practice. Learning with others. That’s what rhizo14 has been. I really wanted to improve and increase the diversity of my learning network. This is a very selfish reason and measure of success. MOOCs that are open are a fertile ground for cultivating your learning network. This course , more than any other that I have done before, have caused me to grow. My network is much larger and much stronger and I feel very much more connected. Success = having participated. Learning and practicing the range of digital literacies needed to participate, even marginally in some areas, is valuable. I made some progress in the “I can’t read everything” department. It may be an illusion of enthusiasm that I’ve “learned” these things but it feels like I have a better grasp on how to know them or reconstruct a more viable approach. I’ve gained a tool of understanding that clarifies things that I didn’t have before. Success = People having a serious conversation or, very often, people having fun together. That’s enough. This has been a good experience and I feel that I passed through something. I want to return to some of the potential paths I spotted over the past weeks and make sense in terms of this rhizomatic learning. Success = I come out with a different perspective on my own network? Do I have at least one or two new nodes (people or ideas) that have altered the landscape or perspective I went in with? Rhizo14 was a rousing success for me and I look forward to ongoing conversation, engagement. / I measure success by my perceptions of the amount of consolidation and change in my thinking and doing. / have stretched me to think outside of the box. I am thinking and engaged in the higher levels./ helped me to think over the questions I had on learning together. I’m grateful for all the people that helped me in my thinking. Success = I was able to take the ideas from the conversations into interactions with colleagues and was excited by their excitement. Success = Yes, for me it was success. There was much beauty, I loved the occasional poem and other artistic expressions. I for myself can say I learned a lot. case 1. I thought that new ideas and ways of thinking about rhizomatic learning would be one measure of success. In fact this could be said to be aligned with the main reason why I joined. I was not entirely convinced that I know what rhizomatic learning is all about. I have to admit that it is not much clearer but I have a working understanding of the idea. case 2. As for content, I finally got motivated to read some of the insanely convoluted writings of the revered Messrs. Deleuze and Guattari. I understand much more clearly how to articulate, “Continued participation in a community like this allows me to be able to do things I did not consciously set out to learn how to do.” I am still grappling with the rhizome metaphor – trying to see positive points in Knotweed. case 3. On characteristic of rhizomatic learning lifted from Dave Cormier is to “…participate with and among those people who are resident in a particular field…” This I have done and will continue to do. In each community I will leave behind my rhizomatic project idea with a rootlet (URL) back hoping the connections might strengthen the meme. I clarified and strengthened my own ideas about rhizomatic education, gained many new ideas to test and work with, and outlined some future ideas that I need to know more about. Win-win-win. I did this MOOC to explore and experience new pedagogies and ways of learning online, discover new people to inspire me and introduce me to new ideas and ways of thinking and it’s certainly been a success from that perspective. It’s been fairly pervasive and made me realise that almost every aspect of life involves some form of learning – life is rhizomatic, and thus rhizomatic learning is about learning about life and living it better. I found myself reflecting on it all the time, and it’s evolved my thinking on a range of things, and introduced me to some new people some of whom will develop with closer ties over time. So? Have I learned anything new? Bentley et al spoke in their article about their reflective exercise. I think it was a suitable concept. This is learning by writing. The descriptions found here are similar to earlier given in so called connectivist principles. The participants belong to that bigger community as I said in my previous post. The theme rhizomatic learning was weakly understood although it was the main content – or there were huge differences in understanding it? The participants didn’t copy Dave’s sayings about how to mooc well, which fact can be considered as positive? The connections to learning theories are weak or hidden, because attitudes against educational sciences are mostly negative? I am only asking comments. If you have read this you may be interested in Tanya’s blog post and article about inclusion and exclusion in rhizo. It was one of those questions in the autoethnography. Exploring learning in open online studies is my hobby and so I wanted to check what is happening to the two research projects of Rhizo14. A group of course participants planned a survey for us and began to gather our answers. It was called an autoethnography. Keith Hamon wanted to activate the process in his blog post “Who is writing the rhizo ethnography?” This post helped me to check the situation and now I know that the raw material is still waiting for researchers. It is open to the writers and nothing has been done since April. 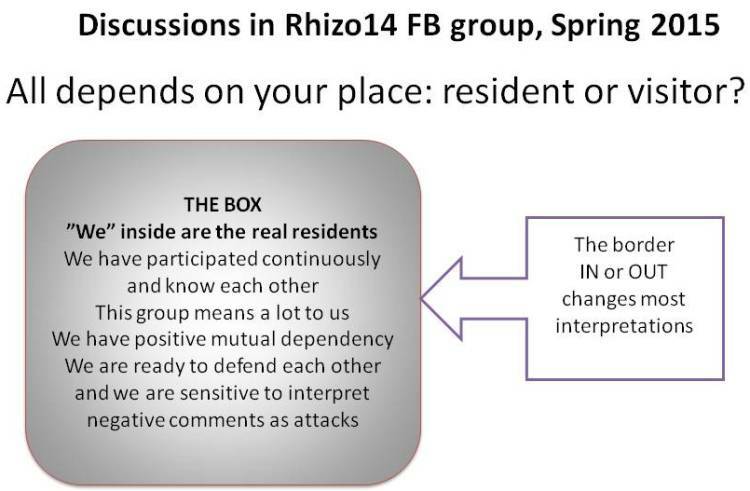 But now the group (Sarah Honeychurch et al) is planning a Hangout and you can follow the process via the FB rhizo group – and participate, of course, if you will. A lot of hard work is waiting for doers. The material consists of answers to many questions about the learning process. You can read the questions in my blog post, my autoethnography. Keith Hamon tells the names of 35 possible authors who have told their stories. How the Rhizo14 experience relates to learning/teaching experiences before, during and after the course, triggered by the rhizome image. Your interpretation of learning and teaching need not be confined to formal settings. 1. How does the image of a rhizome relate to your prior experience of teaching, learning? 2. How does the image of a rhizome relate to your experience of learning during Rhizo14? 3. How might the image of a rhizome represent your future practice? 4. If the above questions did not allow you to fully explain your learning experience in Rhizo14, then please comment in the box below on those aspects of the course which were significant for you, and what kept you in the course or caused you to leave early. It was not easy to answer the questions if you hadn’t thought anything about any rhizomes ( or actually it was easy to tell: no connections). I was a bad answerer in their research but I liked to watch their presentation. I took 2 screenshots of the presentation (the link to it is found in Jenny’s blog post). First they emphasize the complex nature of learning and then they combine the Deleuze-Guattari principles to learning in the course. How are connections emerging? Is it really possible to connect from any to any? Heterogeneity is obvious when the course is open to anyone. There was a huge amount of variety of beliefs and schooling and interests etc. The researchers are working on these concepts in order to find the connections between the principles of rhizomatic thinking and participants’ experiences during rhizo14. The metaphor level is fascinating but it can be used according to the writer’s own beliefs and I am not sure how much it will help. If rhizomes are spreading via clones, it doesn’t sound good or how? How many like-minded students I met on the course? Many? The researchers know that objectivity is not possible in a research where they have acted as engaged participants. It is a challenge to listen to all the voices of participants. One solution could be to write down the researchers’ own beliefs before analysing the material. Transparency helps the readers to assess the researchers’ influence to the results. The other image gives concepts for describing the possible results (or descriptions). Ambiguities and concerns vary greatly in the material. As a participant I could follow many lines (personal orientations) inside the course. Some people were interested in scientific research while most denied its value totally. Artistic line (poetry, word art, videos, images etc.) was very popular and it is a good way to describe complex phenomena. I could define those arrows as clusters toward these lines (conceptual vs images or learning vs rhizomatic learning). In a course without content the personal orientation is most important and it means that many people are worrying about own space and competencies. Are my sayings worth saying or should I be quiet? Self- confidence is not given as a talent. Part of the energy during a course always goes around the own ego -or the facilitator’s ego. It was interesting to hear that someone questioned the community as curriculum – is it possible to use side by side with rhizomatic thinking or learning. The learning process becomes deeper during the research process. I appreciate every effort to deep understanding of human learning. This is a poor reference about Jenny’s and Frances’ presentation. I blended my thoughts here and there and it makes this messy. Please watch the video yourself (18 min). It is in Echo360 environment and you can find other interesting knowledge about MOOCs too. The third survey in my mind was implemented at the end of the course. I checked Dave Cormier’s blog but did not find the results about his survey. Perhaps it doesn’t matter, he is planning the next rhizo course already. My next post will deal with my own summary and my vision for mooc research. It is a hot summer here in Finland and lakes are too warm for swimming, can you imagine that? I came to town because it was too warm at our summer cottage. In this post I will describe emergent learning as a map, landscape or topography. I do not develop my own views today, I repeat what Jenny and Roy had written already. The sources are their article in IRRODL and the wiki for this research. The topic is so challenging that I have to divide my journey into pieces. The images are taken from the article. The aim is to explore ways to visualise what happens in MOOCs, or related open learning event, courses, etc, using the Footprints of Emergence template, based on a work captured in the open wiki which shows how 3D ‘footprints’ are used to map out the dynamics of learning. In any learning community, there is always a need to balance the acquisition of knowledge with the creation of new knowledge. This 3D learning landscape is a model for exploring the relationship between prescribed and emergent learning in any given curriculum. The graphic is a map – it is metaphorically a 3D landscape, or a 3D topography – of a learning environment. It has a ‘valley’ (the dark blue zone in the central circle) an exposed plateaux (the lighter central zone) , an increasingly steep slope (the outer zone), and a very steep slope, down, in the thin, dark zone just before the edge (of ‘chaos’). In this image you can see a half of the whole circle. I have to use the same concepts which the researchers have used. I am not confident with my English (my third language) and it is challenging to handle exact phenomena. In my view every English word has ten meanings and I do not not the connotations in each context. But here is no choice, the research is published in English. I tried a Google translation to my language (Finnish) and it was very funny. This is a 3 D description with a valley and plateaux and slopes. This gives space for imagination. Dynamics is always complex and this is one way to demonstrate it. I need another image to show the 3D properties in a cross section view. I present still some copies about the basic concepts from the wiki. I try to be careful and not to change or distort these descriptions. All of these four zones have value for learning, each in their own way. None of them is, in principle, better or more desirable than any of the others. The central circle (or valley) is the zone of prescribed, fixed, stable learning and knowledge, and has value for learning knowledge which is valid in any context, and can be used by any person. The zone for instruction. The light, central zone (or plateaux) is the zone of ‘sweet’ emergence, for exploring different perspectives, approaches and strategies, for developing your own perspectives, and trying them out in an open but reasonably supportive environment (hence the plateaux metaphor). This is the zone for somewhat challenging learning. The darker outer zone is the zone of ‘sharp’ or ‘sour’ emergence – a continuation of ‘sweet’ emergence in some ways, but much more challenging learning (experienced as either positively challenging (sharp) or negatively challenging (sour) emergence. It has value for moving learners on to new ideas and new perspectives. This is the zone for challenging and more creative learning. The outermost, thin, layer is right on the edge of chaos – high risk, not much support, and potentially in danger of falling off the ‘edge’ into chaos – which might be too much information, too little information, too much isolation, overwhelming crowds – of people, ideas and options, etc. It’s where learning unravels, for many different reasons. It can have value too – for shaking learners out of their comfort zones, and stimulating creativity. This is the zone for provocative and disruptive learning. And then there is the area ‘over the edge‘ which is, unfortunately, where some aspects of learning end up – and from which recovery and re-engagement with learning is much more difficult. You can position factors over the edge too, if that is how you experience them. There is no value in this – it’s not a learning zone at all, it is, instead, a zone for ‘fire-fighting’ and emergency management. Chaos and over the edge area seem to be a negative process here, not a learning area at all. My orientation to changes in the human mind has based on theories of Bateson and Mezirov in which the change to upper levels goes through disorientation and blurry views and conflicts. All researchers of developmental psychology know this gap between old and new in human mind. In this Footprints of emergence the darker outer zone describes this movement toward new thinking. The idea of transformation must also be within the clusters and factors, which describe the individual experiments. The main findings are in those concepts, but I had to paint the landscape first in order to settle my mind down there. I want still to show my visualisation at the beginning of my first open online course CCK08 (September 2008) . You can see the phases from prescribed learning to flow. No chaos but much movement (dynamics). I was eager to learn and optimistic. The research Footprints of emergence has inspired my imagination and now I took the time to read it carefully. The material is open here in wikispace. I am glad that Jenny Mackness and Roy Williams have the courage to grasp this challenge: how to describe emergent learning qualitatively and without distorting the dynamics and complexity. Case studies, narratives, individual experiences are one way forward. In my previous post I commented this presentation from LASI13: Sidney D’Mello has explored Affective engagement in learning. Both positive and negative experiences should be explored carefully, because they have different functions. Confusion and frustration are necessary parts of learning. Frustration is better than being bored. We need a new science of nonbasic emotions, said the researchers. This something that also Jenny and Roy have been working on. They have named four clusters: open/structure, interactive environment, agency and presence/writing. Inside these clusters there are 5-7 factors which describe the dynamic relationship between emergence and prescription within emergent learning, installations, events, courses, even curricula. I had problems with following the clusters named agency and presence/writing but the Germain version in jupidu’s blog helped me. The cluster Agency means Raum für Persönliche Entwicklung and Presence/writing means Eigener Stil/Selbspräsenz. Thanks for the terms. I knew that I should prove the footprints, to use the model in some context in order to understand how it works. I had problems with deciding on the topic, what to assess: my thoughts or acts, my development, a course, its curriculum or implementation. I always think learning as a process from orientation, motivation to doing something and then assessing and evaluating. It seemed that I have to do many footprints for every course or event. Then I decided to try to describe my footprints about CCK08, because Jenny and Roy have analyzed it too. Five years have elapsed after the course and the frame cannot be the same as it was at the real beginning of CCK08, but I tried to describe my holistic experiences during the course. My posts from the autumn 2008 are still in this blog and I read them first in order to remember my authentic feelings. This is my image. Palette 2 is the newest, so I took a photo and put it in Powerpoint for my remarks, stars and lines between them. The researchers have better models in the wikispace, this is only to test the palette. It was not easy to fill the palette. I had a tendency to use bipolar ends, either or (open or structured). It was not easy to describe the course and my experiences as a whole. I should like a more concrete area to assess. I have to divide this palette in pieces later. Every factor seemed to differ from others, but some were closer to others than other ones. I could not throw away any factor. Instead I began to ponder on the learning, where is the content? This is only emergence and its contextual factors? So this could be a tool for self /course assessment and understanding. We are fascinated by the possibilities of the footprint method. On the one hand the clusters and factors are a helpful tool to analyze courses, trainings and learning processes, on the other hand they are very intuitive to use, they are beautiful and they make fun. We plan to use them in future. The researches’ basic frame is that “In any learning community, there is always a need to balance the acquisition of knowledge with the creation of new knowledge.” The footprints deal with these tensions between old and emerging knowledge /learning. I felt that tension during CCK08 and I worked it in every post, so why I cannot tell it now in this image? I don’t know, this is hard work anyway. I miss a program which makes the image in one click (perhaps Roy has it already, I didn’t ask). If the factors were a list in semantic differential and then the user could try different images by clicking, that would be fine. I am reading the book Steve Jobs and this influenced my expectations. Are there any good assessment scales for emergent learning? Semantic differential is something I have studied in 1960’s and not followed after it, but there is a page in Wikipedia about it. Every truth must be found million times. The wikispace footprint-of-emergence is a wonderful place t study and some day I will contribute there, this post is just a beginning.